The punultimate photo in the early days of digital series. Yes, yes I know the leaves are usually green but with the aid of a Lightroom preset all I can see is red. Fairground Attraction. Wasn’t that the name of a band in the 1980’s ? Anyway today’s picture is of someone obviously having a good time on their Summer hols. Today’s image was taken using a Nikon D200, Sigma 10-20mm lens. Processed in Lightroom 2 with a Lomo Velvia preset. The Boundary Riders lot, fixing holes in the dog fence. Gizza job I could do that, I’d loved to do that. Driving hundreds of kilometres along a fence in yer 4WD looking for holes to mend, surely it would send you crazy? But think about it. No colleagues to annoy you, only you and the wildlife for company. The heat and flies by day, camping out under the stars each night. 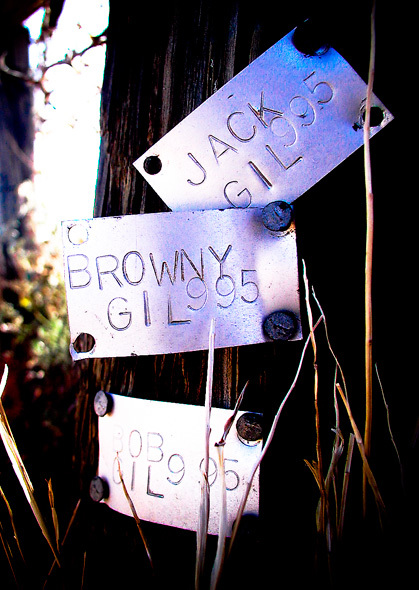 To prove they have completed their patrol, the boundary riders leave a tag on a fence post where the sections meet. There are three tags on this post at Corner Country for it is here where the three states of NSW, QLD and SA meet up. Don’t forget to visit my Pomgonewalkabout web site to read more of my stories and to see more of my photography. Why there is even free admission to an online exhibition of Loughborough images taken in the 1980’s before I emigrated downunder. – Stories of Fun and adventure.